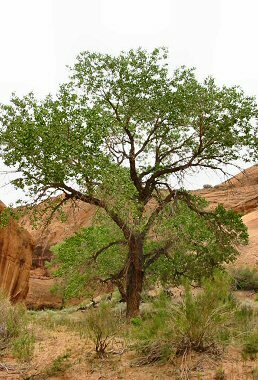 Freemont Cottonwood trees are members of the Willow Family. They typically grow along streams and in moist areas at elevations between 100 and 6000 feet. They are large trees that can grow to 100' in height and have a trunk that can reach 4 feet in diameter. Young trees have smooth gray bark, that becomes darker brown and furrowed as the tree ages. Leaves are roughly triangular in shape with ridges along the edges. They are bright green and shiny, which often makes the trees stand out starkly against a less verdant desert landscape. Cottonwoods grow in moist areas and are often a good indicator that water is not far away. The plant blooms in early spring, producing small greenish yellow flowers, followed by fluffy white seeds (which give the Cottonwood its name). A gust of wind can suddenly fill the air with floating seeds, which then form clumps on the ground like snow drifts. In autumn, the leaves turn a golden yellow before falling.